In this post, we will briefly discuss the relations between circles, sinusoids, amplitudes, radii, and phase offsets in FFT. Let the sinusoid be defined as A*sin(F*w+phi), where F is a positive integer and w is an angular frequency, e.g., 2*pi. Then there is a circle of radius A. The offset can be depicted on the circle as a segment that starts at the center of the circle (0, 0) and ends at (A*cos(phi), A*sin(phi)). On the sinusoid plot, the offset can be marked the amplitude axis (y-axis) at A*phi. The offset has no effect on the frequency spectrum plot.We will illustrate these relations in a series of simple and combined sinusoids. The complete source MATLAB source code is given at the end section of this post below. Let us define a few global parameters. Each global parameter is explained with a comment to the right of it. We will explain below why the SCALE variable is set 500 and how that value can be found. phi = 0; %% phase offset; defaults to 0, try it with pi/2, pi/4, pi/10, etc. The first sinusoid is A*sin(F*w+phi), where A = 1, F = 5, and phi = 0. We will do the FFT of the sinusoid, compute the absolute value of each entry, and divide each value by SCALE. Now we can plot the sinusoid (Figure 1), the sinusoid's FFT spectrum (Figure 2), and the corresponding circle (Figure 3). %% plot of sinusoid 01 shown in Figure 1. %% plot of sinusoid 01's spectrum shown in Figure 2. %% Plot of circle 01 the corresponds to sinusoid 01; plot is shown in Figure 03 below. Why was the SCALE variable set to 500? Let us recompute the FFT spectrum without dividing each value of 500. The new graph is shown in Figure 2X. Note that the value of 1 corresponds to 500 at the amplitude axis. Hence, the value of the SCALE variable. Let us investigate how the change of phase affects the graphs in Figures 1, 2, and 3. All we need to do is to set the value of the global variable phi to pi/4 and re-run the program. phi = pi/4; %% phase offset; defaults to 0, try it with pi/2, pi/4, pi/10, etc. The new graphs are given in Figures 1a, 2a, and 3a. The modified sinusoid in Figure 1a starts at 1*pi/4 = 0.7854 on the amplitude axis. The graph of the scaled FFT spectrum in Figure 2a is unmodified, as expected. The graph of the corresponding circle in Figure 3a has an offset shown by the radius drawn from [0, 0] and [A*cos(pi/4), A*sin(pi/4)]. Figure 1a. 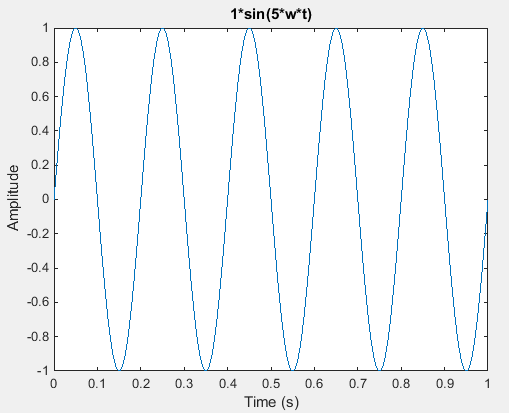 Plot of 1*sin(5*w*t+pi/4). The second sinusoid is A*sin(F*w+phi), where A=2, F=4, and phi=0. We will do the FFT of the second sinusoid, compute the absolute value of each entry, and divide each value by SCALE. Now we can plot the second sinusoid (Figure 4), the second sinusoid's FFT spectrum (Figure 5), and the corresponding circle (Figure 6). As expected, the amplitude in Figure 4 goes from 2 to -2, the frequency value of 5 in Figure 5 has the corresponding value of 2, and the circle's radius in Figure 6 is 2, which corresponds to the amplitude of the second sinusoid. %% circle 02, shown in Figure 6. The third sinusoid is A*sin(F*w+phi), where A = 3, 3 = 4, and phi = 0. We do the FFT of the third sinusoid, compute the absolute value of each entry, and divide each value by SCALE. Now we can plot the third sinusoid (Figure 7), the third sinusoid's FFT spectrum (Figure 8), and the corresponding circle (Figure 9). As expected, the amplitude in Figure 7 goes from 3 to -3, the frequency value of 3 in Figure 8 has the corresponding value of 3, and the circle's radius in Figure 9 is 3, which corresponds to the amplitude of the second sinusoid. %% circle 03 corresponding to 3*sin(3*w*t) shown in Figure 9. The MATLAB code given below has seven more simple sinusoids. You can run the MATLAB code to look at the graphs. We will skip them for the sake of space and proceed to the graphs of complex sinusoids obtained by adding simple sinusoids. The sixth sinusoid is sin01 + sin02 = 1*sin(5*w*t+0) +2*sin(4*w*t+0) . We do the FFT of the sixth sinusoid, compute the absolute value of each entry, and divide each value by SCALE. In the plots of the sixth sinusoid, we will keep the MATLAB figure numbers. Thus, the sixth sinusoid is shown in Figure 26, the sixth sinusoid's FFT spectrum is in Figure 27, and the corresponding circles of the two component sinusoids are shown in Figure 28. %% plot of sinusoid 06 = sin01 + sin02 shown in Figure 26. %% plot of sinusoid 06's spectrum shown in Figure 27. The plot shown in Figure 27 shows two component frequencies, 4 and 5, and their corresponding amplitudes are 2 and 1, respectively. %% two circles corresponding to the two component sinusoids of the sixth sinusoid. The seventh sinusoid is sin01 + sin02 + sin03 = 1*sin(5*w*t+0) +2*sin(4*w*t+0)+3*sin(3*w*t+0) . We do the FFT of the seventh sinusoid, compute the absolute value of each entry, and divide each value by SCALE. We will again keep the MATLAB figure numbers. Thus, the seventh sinusoid is shown in Figure 29, the seventh sinusoid's FFT spectrum is in Figure 30, and the corresponding circles of the three component sinusoids are shown in Figure 31. Let us see what happens to the graphs of the seventh sinusoid when we set phi to pi/10. The graphs are given in Figures 29a, 30a, and 31a. As expected, the phase change is reflected in Figures 29a and 31a but has no effect on the FFT spectrum in Figure 30a. The 9th sinusoid combines both sine and cosine curves sin02+cos03+cos05 = 2*sin(4*w*t+phi)+3*cos(3*w*t+phi)+5*cos(1*w*t+phi), phi=0. The graphs of the sinusoid and the FFT spectrum are given in Figures 34 and 35. The circles are not plotted for the sake of space. %% F is a positive integer and w is an angular frequency, e.g. 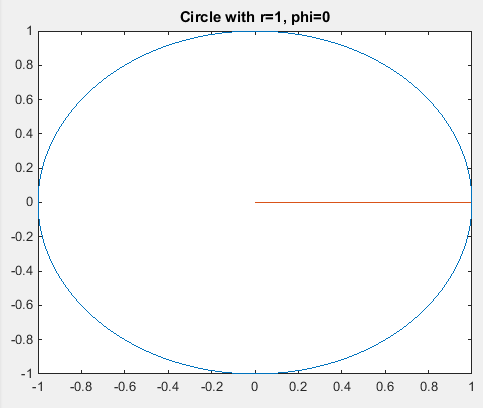 %% center of the circle (0, 0) and ends at (A*cos(phi), A*sin(phi)). %% A*phi. 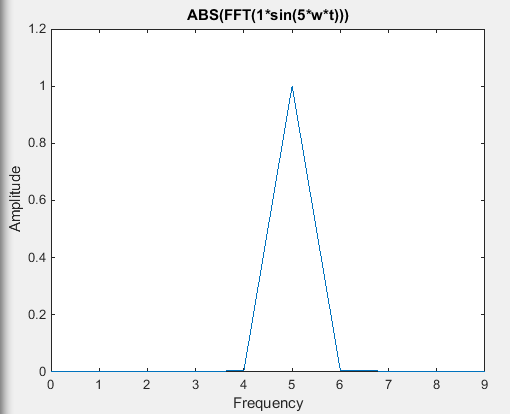 The offset has no effect on the frequency spectrum plot. %% No circles are plotted.